Edhi before moving to the Gotki station, at times, he felt himself in a weird situation, his feet were heavier appearing that he hasn’t, and thinking why today, he appears flinching from his commitment of service to humanity, his wife Bilquis Edhi asked, why you aren’t ready to go Gotki, are you feeling sick? There was no reasonable reply, all these made him to stop for few moments. And then immediately he went out of his Mithadar Head Office to reach at the helipad to immediately reach Gotki. Edhi is now on board on his chopper and travelling towards the Gotki – the site of incident, between two trains. In the mid air, Captain of the crew asked from Edhi? Mowlana! was your grandson hospitalized in hospital, and then soon he disclosed that his grandson has expired. 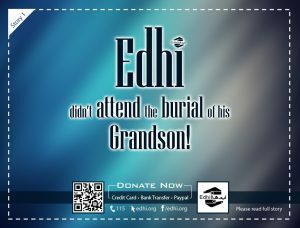 Upon this, Edhi realized and came to the conclusion that the major reason of pulling his feet back was – the death of his grandson and that was indicated by his 6th sense, before moving out of his office. 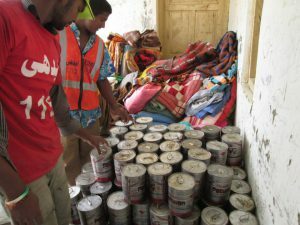 This story shows that he never compromised on his humanitarian responsibilities, he went ahead and after completing his social welfare work, he then came back immediately to his home. The lesson in this story is that, at such times, when neither mind nor thoughts are supporting, and to this extent that these signals are giving the indication of don’t go ahead, at such time, nobody takes the step and would be ready to compromise on the service to humanity. Yet Edhi never compromised on his commitment – service to humanity. Edhi by fighting with his internal lack of readiness, and then by conquering the internal war, moves ahead on the biggest task of humanity. He did his task, and rewarded by Almighty Lord. Edhi you have true passion for the service to humanity, you are great!!! in "Business Loan , Car Loan"
Edhi didn’t attend the burial of his grandson! in "Car Loan , Debt Consolidation"